The Lightsnake, Simple Instrument-To-PC Transfers | OhGizmo! 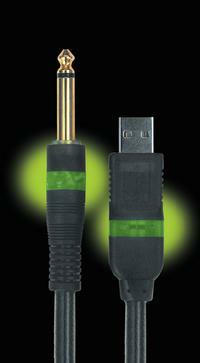 an intelligent instrument-to-PC cable with embedded analog to digital converter and signal booster. The LightSnake USB?s unique design enables anyone to plug their guitar, bass, keyboard or other electronic instrument directly into a PC eliminating the hassle, clutter and learning curve associated with high-quality digital recording. You should know this little product won “Best in Show” honors at the 2006 NAMM (National Association of Music Merchants). It’s $70, and available from a variety of retailers, including Target. Fulls specs, after the jump. It retails for $39.99, according to their message board.